Are you an e-commerce merchant looking for iPhone or iTouch apps to make your life easier, especially on the move? Look no further. There is a wealth of electronic evolution for Apple products that are geared to making your life easier and more fun. Here are my personal favorites. Social Media has taken the Web by storm but it also has a vital place in mobile technology. One of the best ways to keep in contact with your customers, and to maintain a valued relationship, is via social media and there are apps that help you do just that. Take the Meebo, Twitter and Facebook applications to start with. You can share views, news, images and even videos. Check out the Apple App site for a wealth of other social apps that allow all types of possible interaction and functionality. Anyone that cares for their business should care for their customers and using social media is one way to do so. Do you know how many visitors your site had yesterday? Last week? Do you know the current conversion rates? If not, download some analytics onto your phone and check your data when on the go. The Analytics app is classed as the “premier Google Analytics app” – putting your GA data right where you need it, whether in the office or on the move. BAM Analytics Pro allows you to do a similar thing but, additionally, allows the creation of customized reports and advanced data (as if the basic Google Analytics data wasn’t enough). You have access to over 65 reports which can be exported easily to CSV, XML, or E-mail. My favorite, however, is Ego, which shares its analytic power with social media websites such as Twitter, Tumblr and Vimeo. Sweet and powerful. Are you looking for people to make payments for your products or services? How about when they, or you, are mobile? Well, luckily there are payment apps, too. Security considerations are fully matured and customers can be assured of safety in transactions via such apps. mPayy allows users to make and receive payments, follow any activity, and withdraw funds from a mPayy account. You also have the ability to track transactions in a Magento store. If you have an Authorise.net account, then why not use the Credit Card Terminal by Inner Fence to use credit cards? Just phone up and you have a safe and secure way to make that important sale on the go. The one thing you cannot do with the Swipe Credit Card Terminal app is, well, swipe a card. A misnomer perhaps but nevertheless another fast and secure way to get customer credit payments after they, themselves, plug in the details. If you are online then you want customers to reach your store. Yes, you can use Pay-Per-Click adverts (using PPC Editor for example) or you can just go out there and get those important organic (and free) listings. How can you do this with your Apple gadgets? Simple! One app, proSEO, will analyse any web page you give it and then highlight areas of improvements (you can, naturally, spy on your competitors). If you want to have a bit of fun and see exactly where your site ranks then check out SERPS – but, fair warning, it CAN be addictive! E-commerce is now able to benefit from a huge and expanding number of apps for mobile technology. Not only can customers receive a better and more immediate service, but E-commerce store owners with smart mobile devices can now capture that all-important customer data, customer loyalty and, of course, actual payment. About the author: Mark Clayson is a small business entrepreneur and social media expert. 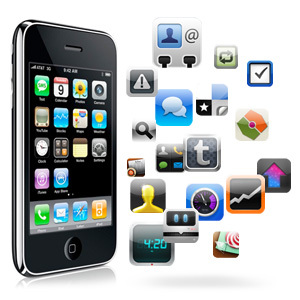 He also helps develop iPhone applications for all types of businesses. Connect with him on Twitter.